Sunday, March 10, 2013 ratings — New episodes: America’s Funniest Home Videos, Once Upon A Time, Revenge, Red Widow, The Celebrity Apprentice, 60 Minutes, The Amazing Race, The Good Wife, The Mentalist, The Cleveland Show, The Simpsons, Bob’s Burgers, Family Guy, and American Dad. Episode reruns: The Celebrity Apprentice. 7pm – America’s Funniest Home Videos: 1.4 in the demo (-18% change) with 6.31 million. 8pm – Once Upon a Time: 2.2 in the demo (0% change) with 7.45 million. 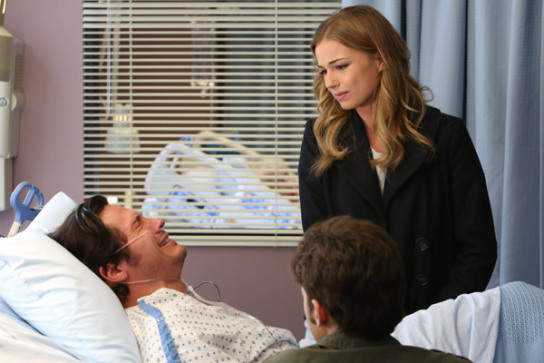 9pm – Revenge: 2.0 in the demo (+11% change) with 6.83 million. 10pm – Red Widow: 1.2 in the demo (-20% change) with 5.32 million. 7pm – 60 Minutes: 1.6 in the demo (0% change) with 11.35 million. 8pm – The Amazing Race: 2.3 in the demo (-8% change) with 9.23 million. 9pm – The Good Wife: 1.5 in the demo (-6% change) with 9.08 million. 10pm – The Mentalist: 1.6 in the demo (+7% change) with 9.43 million. 7pm – Bob’s Burgers: (rerun) 0.9 in the demo with 2.14 million. 7:30pm – American Dad: 1.6 in the demo (-16% change) with 3.29 million. 8pm – The Simpsons: 2.2 in the demo (0% change) with 4.86 million. 8:30pm – The Cleveland Show: 1.8 in the demo (0% change) with 4.06 million. 9pm – Family Guy: 2.6 in the demo (+8% change) with 5.24 million. 8:30pm – Bob’s Burgers: 1.8 in the demo (+6% change) with 3.86 million. 7pm –Celebrity Apprentice: (rerun) 0.8 in the demo with 2.54 million. 9pm – Celebrity Apprentice: 1.7 in the demo (0% change) with 4.97 million. What were you watching last night? The return of Revenge, other original episodes, or something else? I enjoy watching Revenge, so I do hope this show sticks around for awhile. The twists are very intriguing at times which brings us back each week. ABC is not my channel to watch, CBS is as is TNT, USA and Life mostly. I love Emily Vancamp. This show still has some twists and surprises up it’s sleeve! But I’m really concerned about Red Widow. Radha Mitchell makes a strong female lead, but I don’t know if they’ve written her strong enough. The numbers vs The Mentalist don’t look good; 1.5 million sets of eyeballs is a lot to lose from 9 to 10. Revenge is on the downslide. They finally knocked off the fake Amanda, thank you writers. But then bring in a foster brother, dumb move writers. How low can this show go?